The 30-year-old wooden fence was on its last legs. It had been repaired over and over with new slats and new 2X4s, but even the posts were rotted out and one snapped off with just a slight push. It was time for a new one. 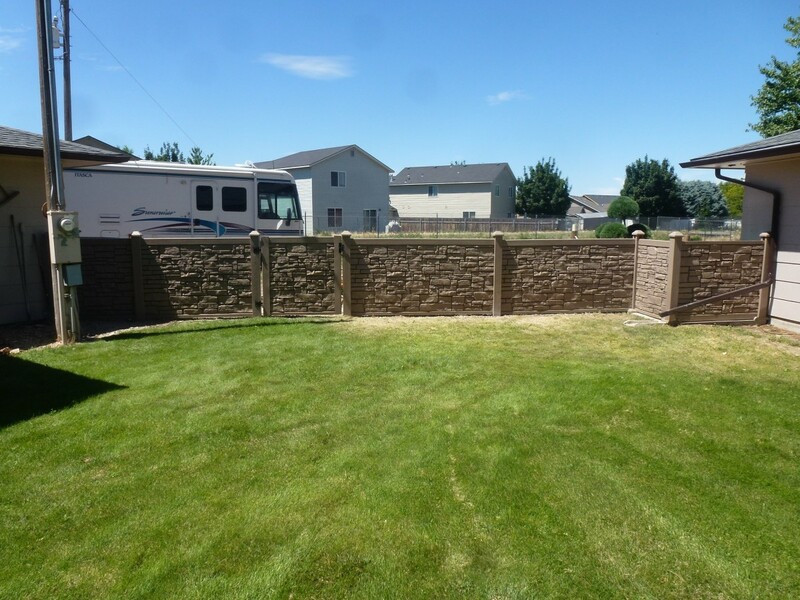 After looking over what was available, we decided to go with a Sim Tek product, a faux stone look in a vinyl fence. Guaranteed for 25 years and able to withstand a 100 mile per hour wind, it will probably last longer than I do. A very high-quality fence (with a price to match), but the finished fence will always depend on the quality of the work done to install it. Here's how to do it right. There aren't a great many tools needed, but there are some. 4' level. A torpedo level may be useful if fastening to a concrete slab or wall. Post hole digger, either hand or motorized. 10" or 12" holes will be needed, depending on the fencing purchased. Sawzall. Not necessary if the circular saw will cut a 5" post. A hacksaw will work. Drill. 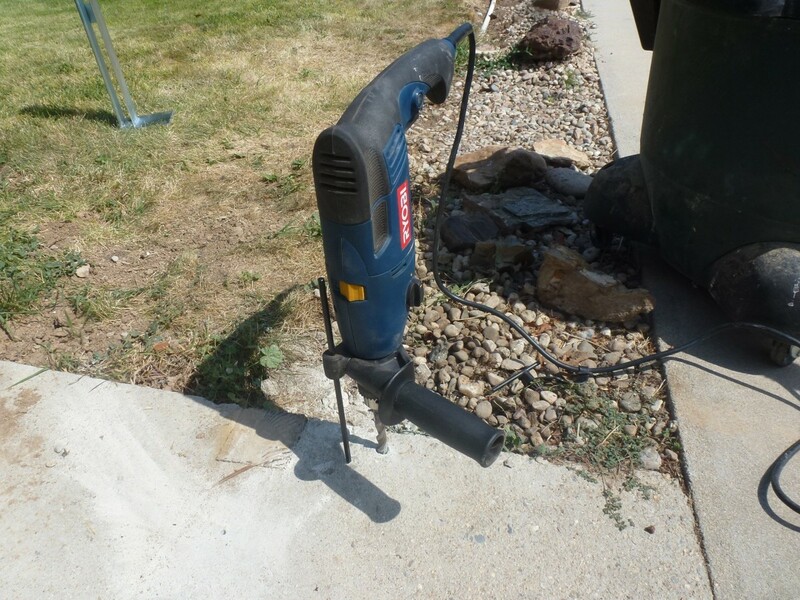 An impact screw gun is ideal, but a drill/driver will work. A 3/8" hex bit will be required for post screws. Hacksaw or other metal cutting tool. We used a peanut grinder with a cut off blade to cut the stiffeners. Stakes and braces. 1X2 lumber works well. Braces need to be about 7' long. The first step is always to lay out where the fence will go, and determine how many panels and how many posts are necessary. We ordered the materials through a local home improvement store (Home Depot) but it was a special order, meaning it cannot be returned and if additional materials are needed it would take time (and additional shipping cost) to get it in. Take care in measuring the length and determining what materials are needed. 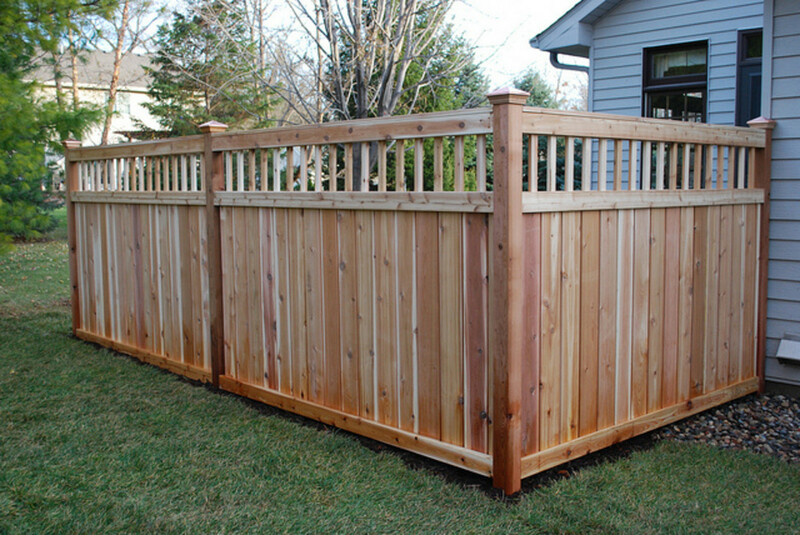 Fencing varies in height, length and gate openings so the number of posts and panels depend on the specific fence panel purchased. We laid out the posts with some scrap wood laid on the ground to aid in counting how many panels and posts were needed and drew a picture as well. 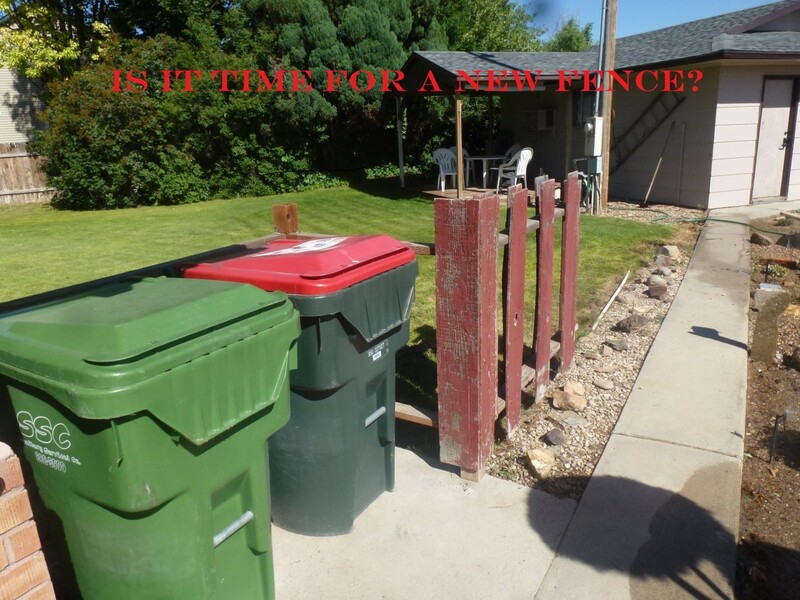 A portion of the new fence was to go on a concrete slab, turning two corners around trash cans to partially hide them from street view. That meant not only 2 corner posts, plus an end post for the end of the fence, but special brackets to attach to the concrete pad. 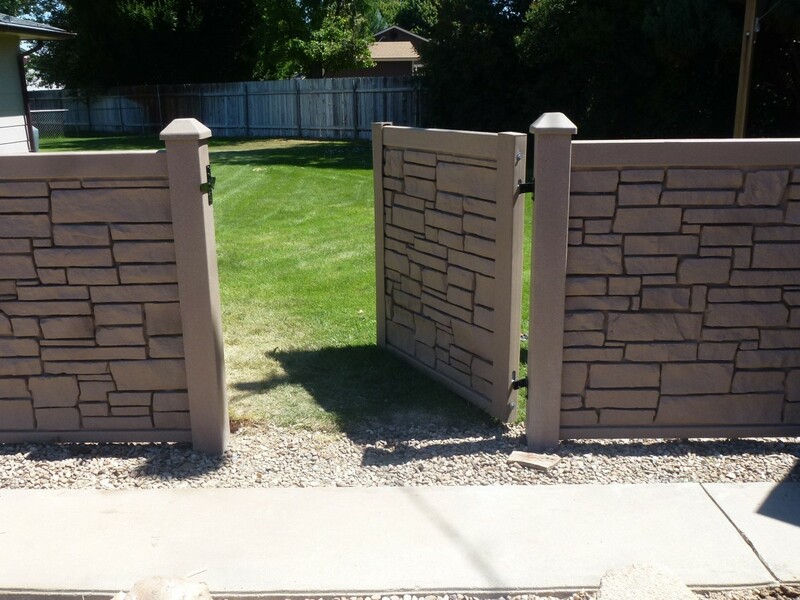 Gates require a gate post and an end post as well, and the other end needed an end post. We ended up with three end posts, one gate post, two corner posts and only two of the line posts that go in the center of the fence. The panels we chose were 4' high and 8' long (there are options here) so we needed 5 panels for a fence that was about 38' long, and we chose a gate that was 4' wide. In addition to the basics, we needed 3 brackets for the concrete, 3 trim rings for them and 8 post caps for the top of the posts. Don't forget the small pieces - they are what makes it all come together in a pleasing package. 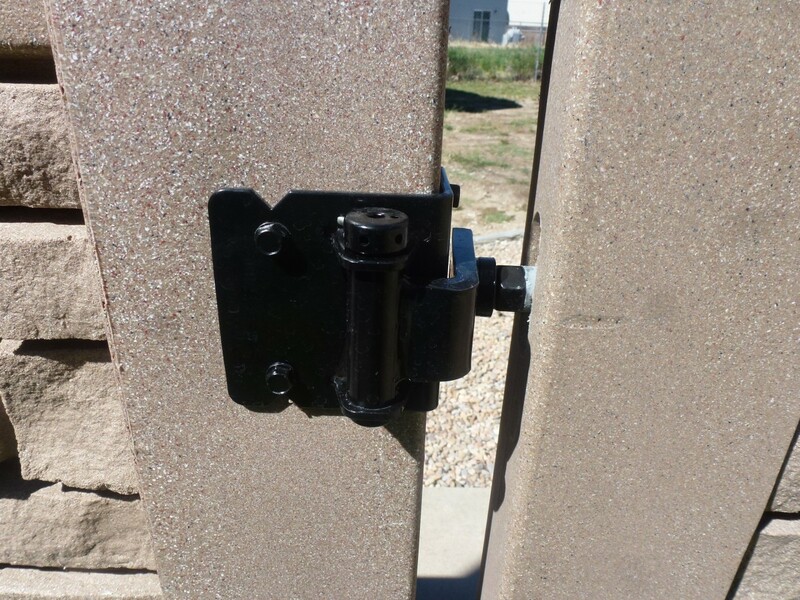 The concrete brackets must be fastened to any slab or retaining wall with anchors. Once we had the brackets in hand we set them on the slab and slid the posts over them in order to see exactly how they would have to sit to make straight angles and exactly where the holes needed to be drilled in the concrete. The plan had to be modified a bit as the corner posts must be turned the right direction, the brackets are not square and the post does not fit in the center of a corner bracket but to one side. This required moving the planned fence panel to one side, but it was a matter of only a couple of inches and did not materially affect the overall plan. 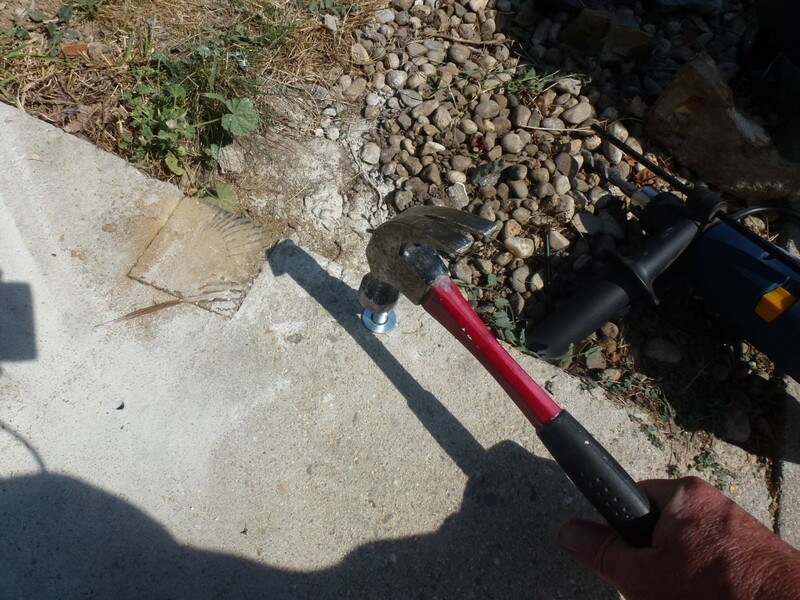 Half inch holes must be drilled into the concrete with a hammer drill (available for rent at most home improvement stores) and ½" concrete anchors driven in with the length of the anchor determined by the thickness of the slab. Sim Tek recommends 6" anchors but few slabs are that thick. 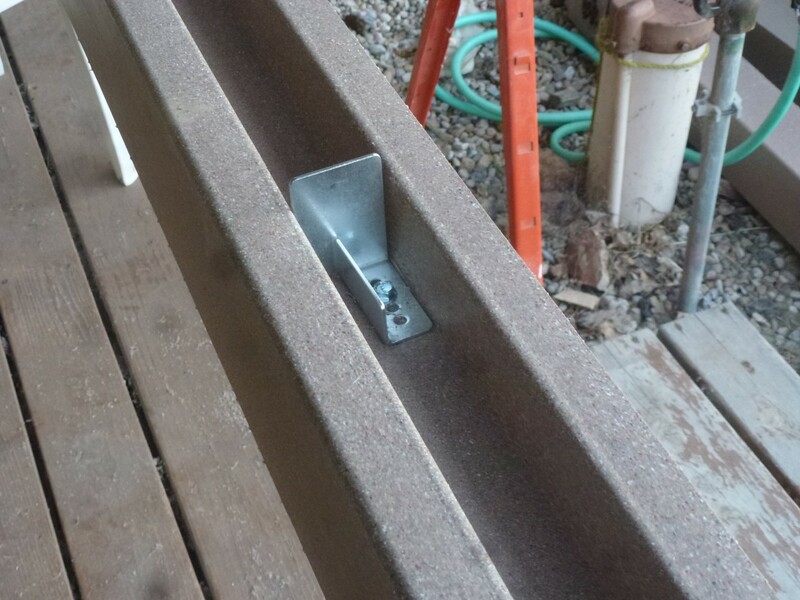 The brackets are then bolted to the concrete, the trim slid over them and the posts slid onto the brackets. Long screws are provided and are driven through the post and into the bracket to fix the post to the bracket. Pre-drilling the holes was necessary here as the self tapping screws simply broke off on the bracket. Correct placement of the post holes in important! Take some time and get it right for it will pay large dividends down the road. We had a sidewalk to measure from, but an alternative method is to stretch a string from the outside of the first post to the last, a few inches above the ground. Using a laser level, we were able to not only locate that outside edge of the post on each end, but also the desired height above ground. Drive stakes or provide some other method of tying the string at each end; we used a screw driven into a building wall for one end and the post already set on the concrete pad on the other. 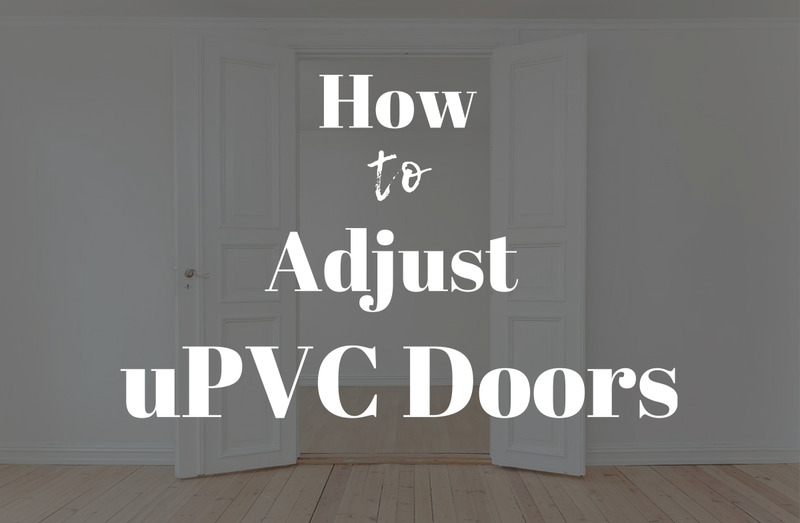 It will be necessary to remove the string to dig holes, so fasten it in a manner that is easily removable but can be put back into the exact same spot each time. A template was made, 10" in diameter and with the center marked. This template was placed on the ground in exactly the right spot and the ground painted with traffic spray paint around it. 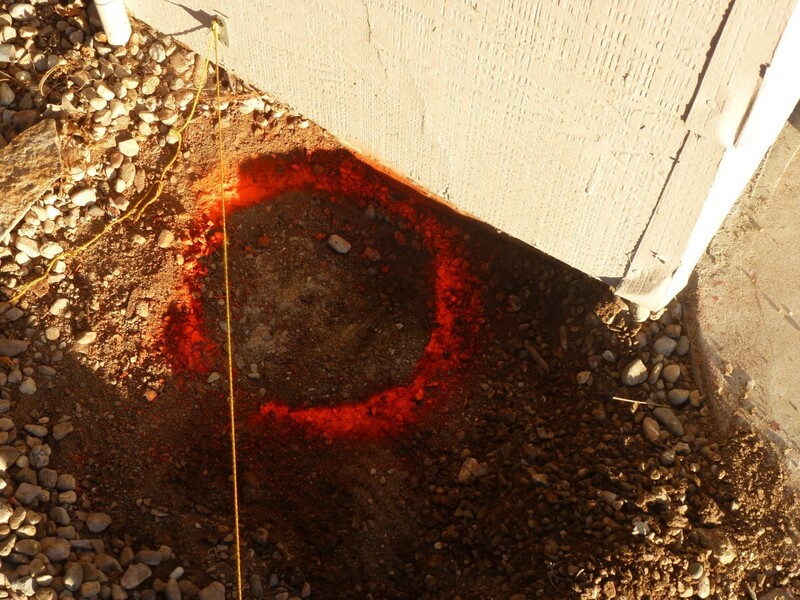 In this manner, the exact location of the hole to be dug was marked and easy to follow. 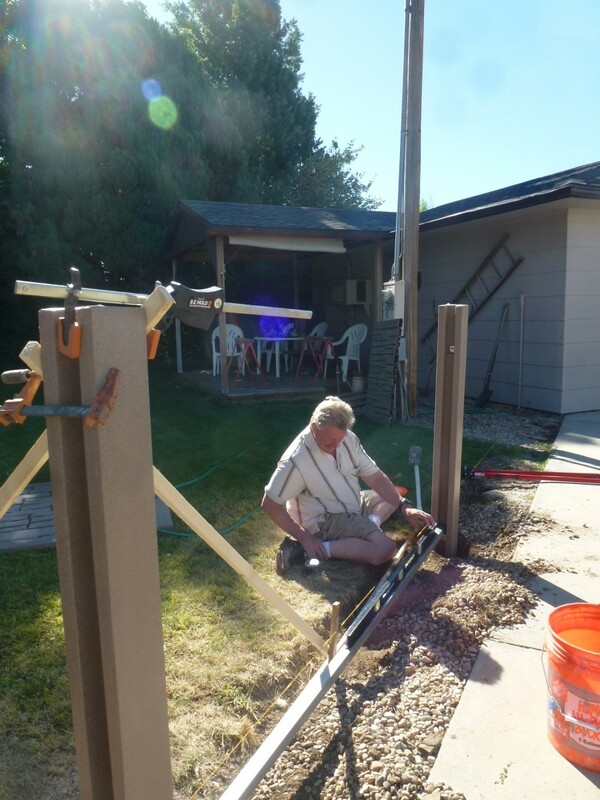 The distance between post holes will vary with the panels used; our panels were 8' long and the distance between center of the holes was to be exactly 95". We chose to dig just two holes at a time, which took longer but was preferable in 100 degree heat. The depth of the hole will depend on the fence panels as well; ours were to be 24" deep and we dug just slightly deeper and added some gravel to the bottom of the hole. Inside of each fence panel are two "stiffener" rods; a square steel tube that will determine the distance between poles if the panel is not to be cut. They make a good check on the spacing before digging as they are just one inch shorter than the center to center distance between posts. With the holes dug, it is time to set the posts, and once more extreme care needs to be taken to get it right. There isn't a lot of room for error here. 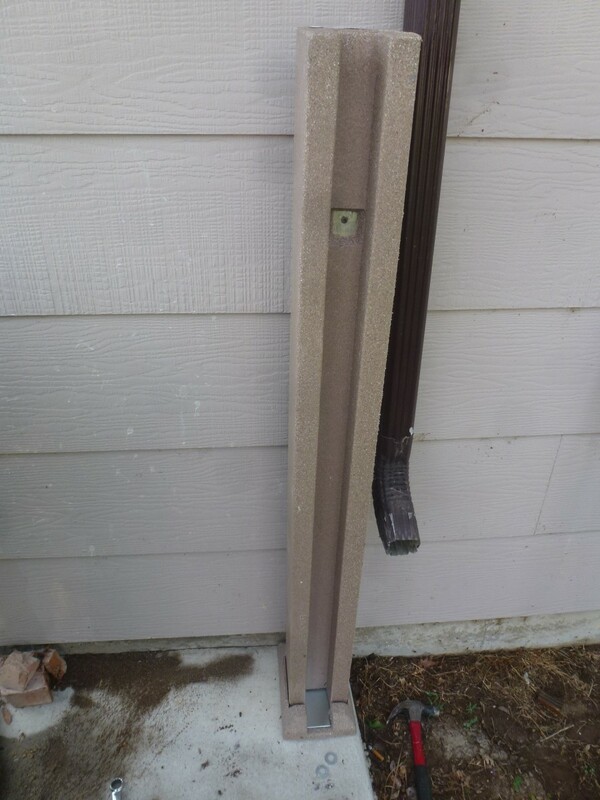 There is a small steel bracket that needs attached to the post. The fencing will sit on this bracket; it is what holds the panel off the ground and must be set at the proper height. 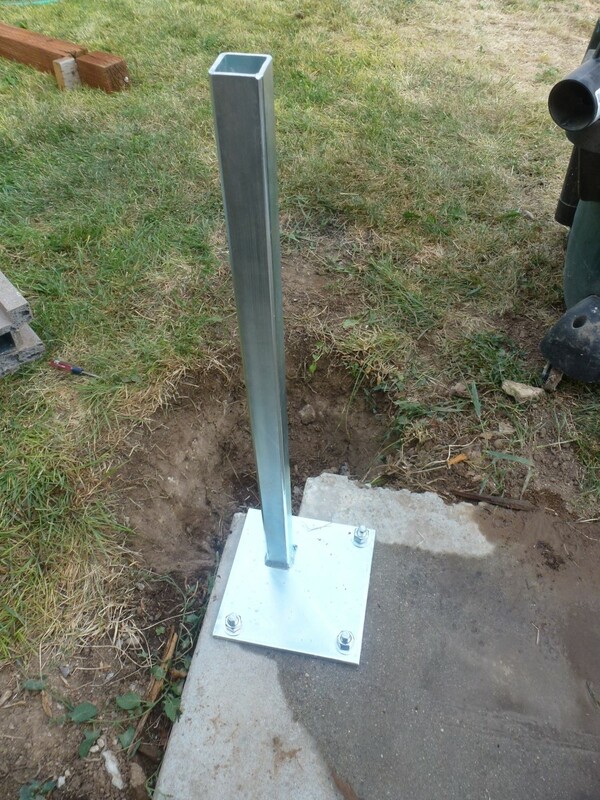 For our panels, 48" high, it was to be placed 49½" from the top of the post, but this can be varied if accommodation needs to be made for uneven ground. Our ground was not level, and the fencing gradually steps up over the length of the fence, so that measurement did vary some on line posts with a panel on each side of it. Depending on the height of your panel, posts may need cut to a shorter length.. Our panels were 4' high, but the posts were 8' tall; that requires nearly a 4' deep hole! Posts were cut, making sure to always cut the bottom, not the top, of the post. Cuts were made with a circular saw with a carbide blade; there is a steel tube in each post that will quickly destroy a saw blade that isn't carbide tipped. They were a little difficult to cut because of that tube, but a cordless circular saw did the trick without undue problems. We found the saw blade didn't quite make it clear through the post, and a sawzall was used to make the final cut after the circular saw was used. Draw a line, using a square, completely around the post and make a cut on opposite sides. If necessary cut the final inch with a sawzall or even a hacksaw. To find the proper place to cut, we set the panel bracket, screwing it into place with the provided screw, and then measured down from that 24" plus the amount the panel was to be above ground. If you're off an inch or two it won't matter; too short and you can add some gravel (dirt isn't a good idea) to the hole and if too long either re-cut the post or dig an inch deeper. 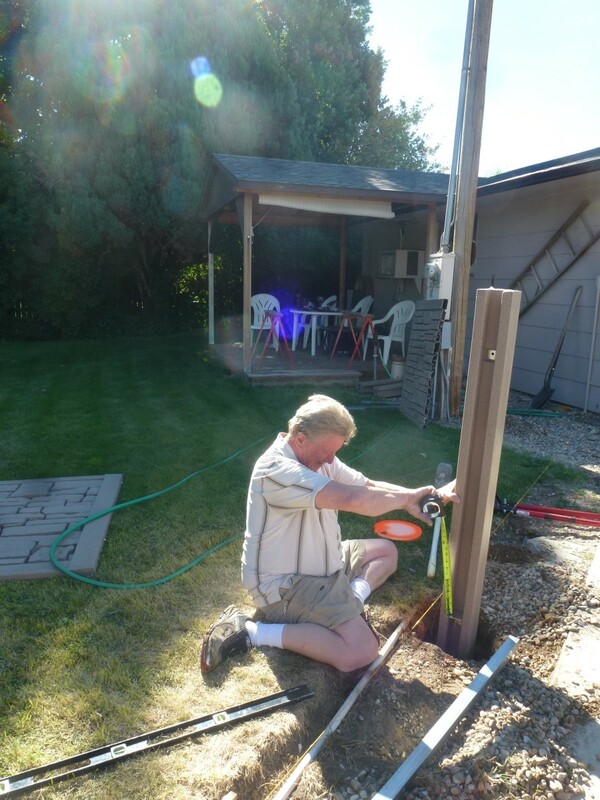 The post is then set into the hole, using the string to check the height of the fence bracket. 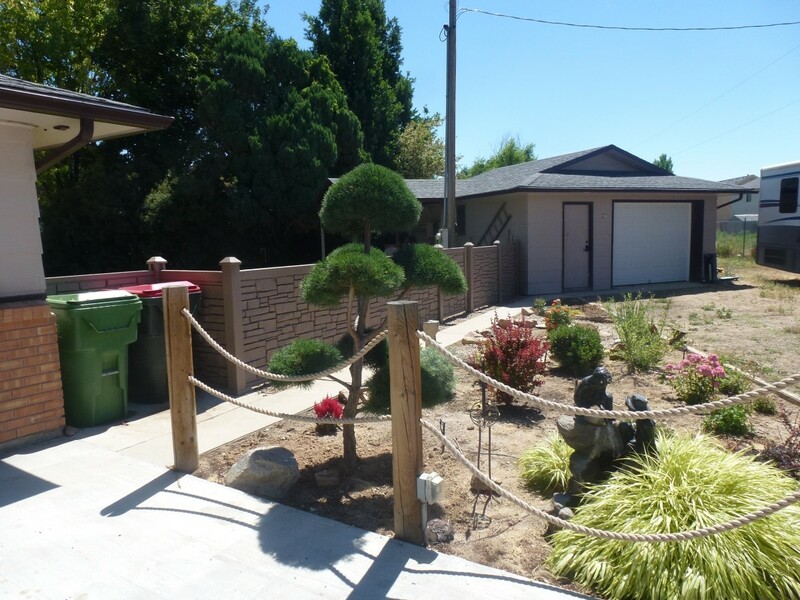 Again, the height can be adjusted small amounts by adding or removing gravel. Make sure the side of the post lines up with the string and isn't twisted one way or the other, just touching the string. Level the post, making sure it is absolutely vertical by using a 4' level on two adjacent sides. Using a stiffener removed from a fence panel, check the distance between posts. The stiffener should just touch each post in the groove where the panel will fit. Leave the stiffener in place until the concrete is set. The post must now be braced to make sure it doesn't tip while adding concrete. Fasten braces near the top of the post and to stakes temporarily driven into the ground. We used woodworking clamps to fasten braces to the post, but even bungee cords could be used if you are careful not to bump the post. You are ready to add concrete to the post hole. We used a quick set concrete mix designed to be added to the hole dry and then filled with water, eliminating the task of mixing the concrete, and it works very well. 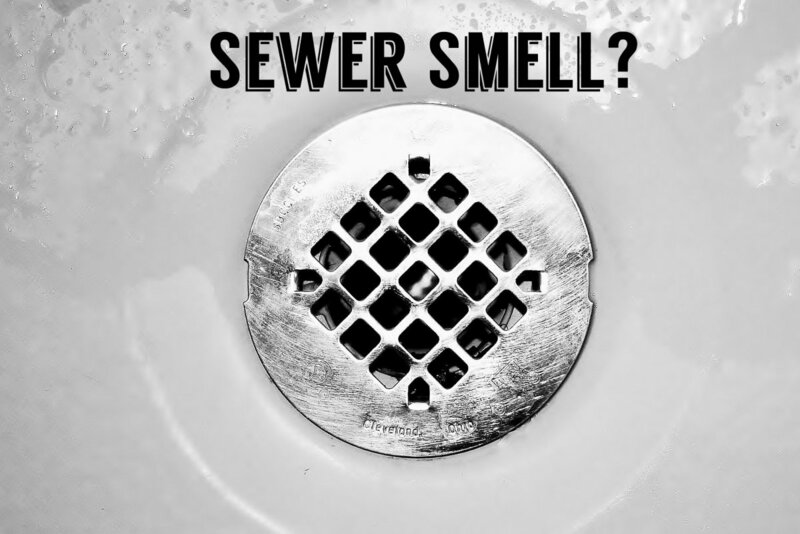 The post isn't disturbed nearly as much during the addition of the concrete as it is powder and flows into the hole gently and evenly, and mixing is not necessary. If this method is used, fill the hole to within about 3" of the top and add water. 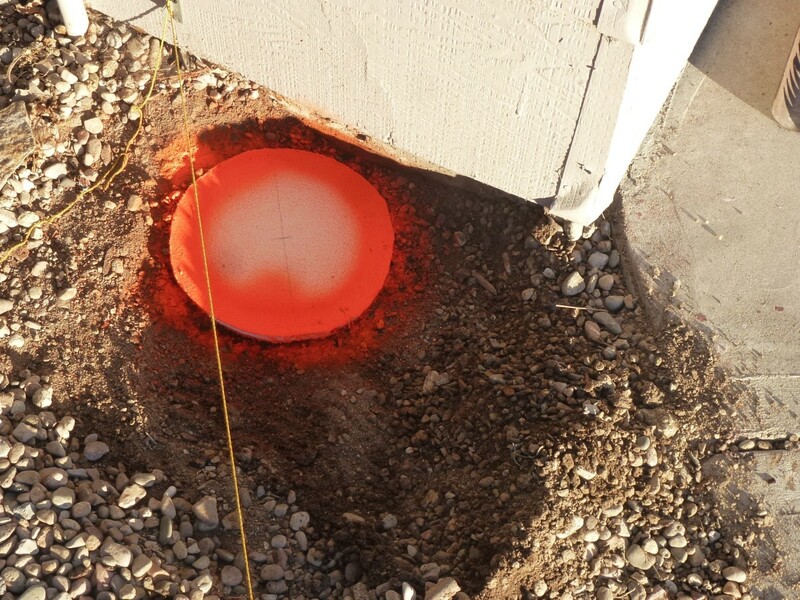 For our 10" X 24" holes it require 1½ 50 pound bags of concrete per hole and 1½ gallons of water. 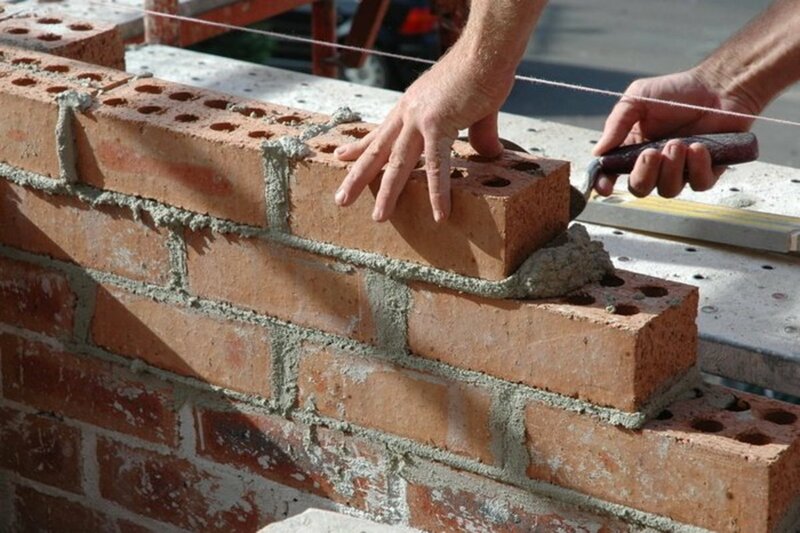 While adding concrete to the post hole, wet or dry, put a few inches in and re-check the post for plumb. Fill the hole half way and check it again. Finish filling and check it again. If you are using the dry method, check after adding the water. 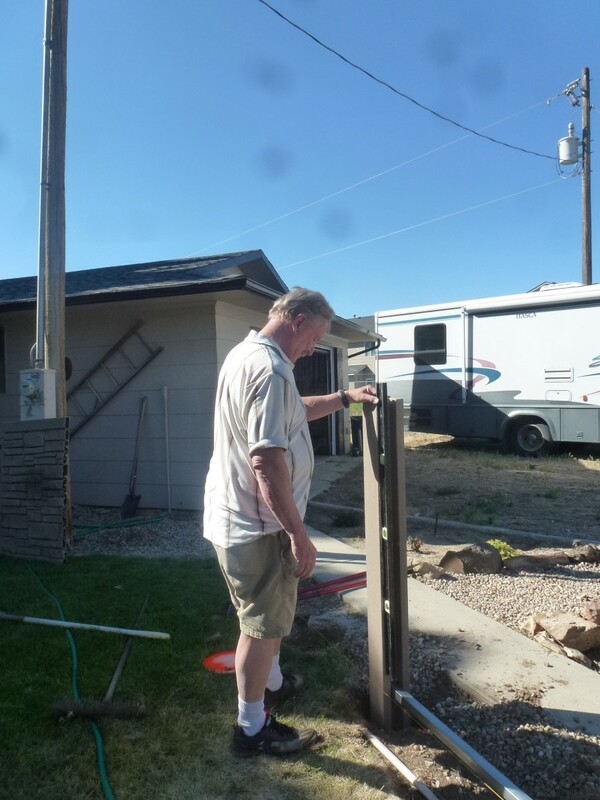 Make sure that post is vertical and plumb and stays that way! We found that it worked well for us to concrete a post into place and then mark and dig the next hole. As mentioned, it took longer and we only got two or three posts per day done that way, but we didn't work except in the early morning and late evening, either. We found that we could mark, dig the hole, cut and set the post in one to two hours. Fence panels are next, or they can be added as the concrete completely sets up. They will sometimes need cut, and this is again done with a circular saw. Remove both the top and bottom stiffeners and cut the stiffeners the same distance as the space between posts, in the grove where the panel will go. They should normally just touch each post. Those posts that are fit over concrete adapters, and have screw heads in the panel groove, should have the stiffener cut just enough shorter to clear the screws as they are lowered into the post. Check they aren't too long by evenly lowering the stiffener into the groove without the panel. 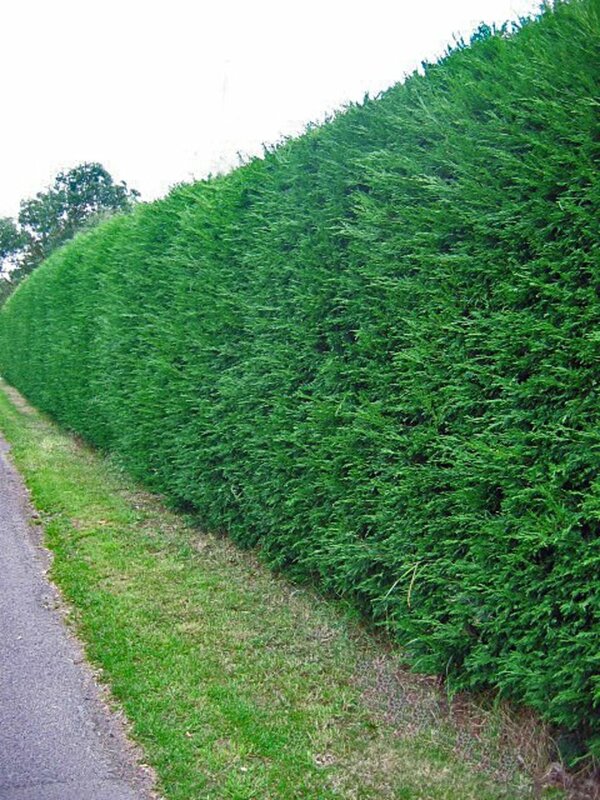 Panels should be cut ½" shorter than the stiffener. This is to allow expansion and contraction of the vinyl panels when the temperature changes. 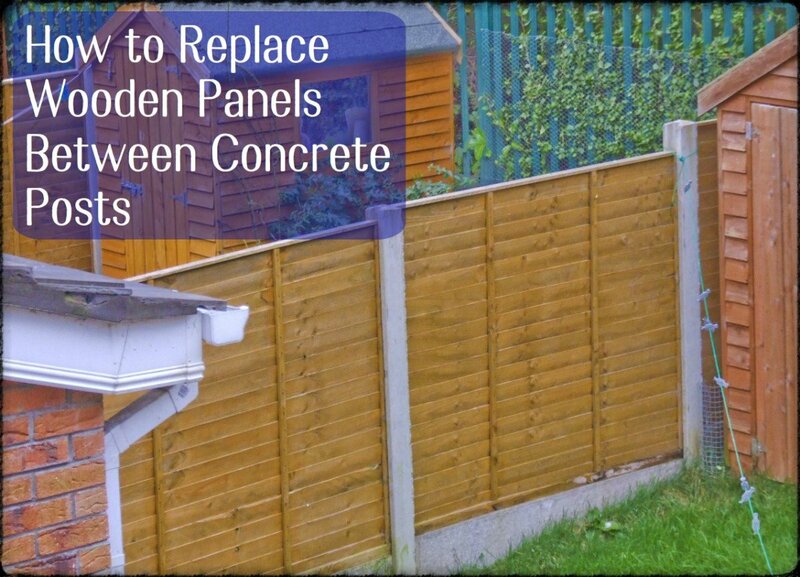 Insert any removed stiffeners back into the fence panel and, using a helper, slide the panel into the grooves on the posts. During the planning stage the length of the final panel or two should have been considered. We found that the last panel was less than 3' in length and to increase that some we cut about 2' off the panel just before it. We thus had a 6' panel and a 5' panel rather than a full 8' panel and a very short one at the end. The appearance was improved by doing this and it should be considered if the last panel is to be cut quite short. The decision must obviously be made before the holes are dug for the last two posts. 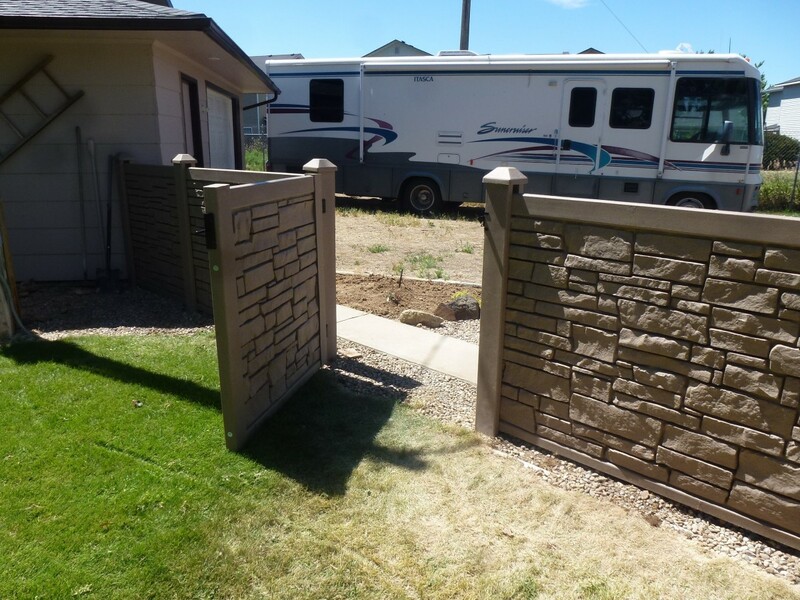 Gates can be put nearly anywhere that is convenient with proper planning. 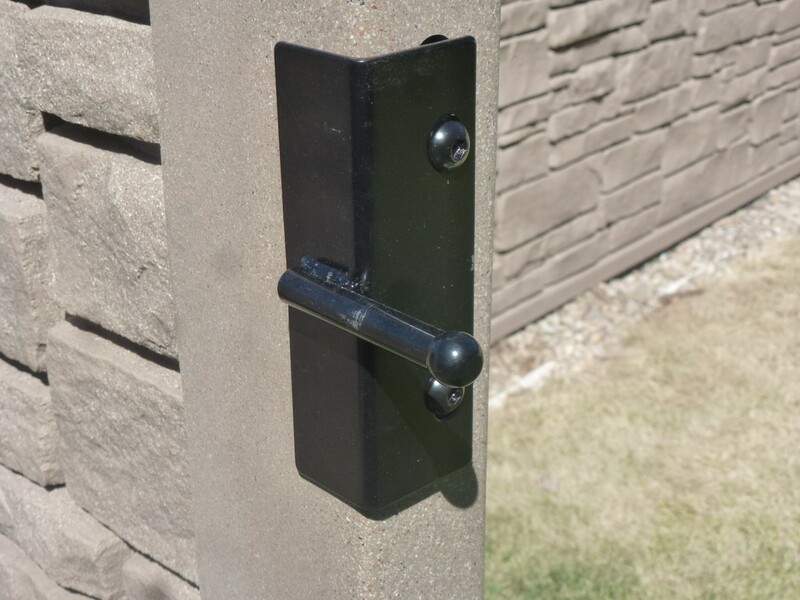 Each gate will require a "gate" post on the hinge side and an "end" post on the latch side, unless a double gate is used whereupon there will be no "latch side" post at all. While the gate post looks like an end post, it is not. The steel tube inside is much larger and stronger to provide for the weight of the gate hanging off of it. Make sure you don't get them confused and double check the label before using it. We set our one gate post aside, where it would not be mistaken for an end post, until we were ready to set it. The posts for the gate are very critical in their spacing. 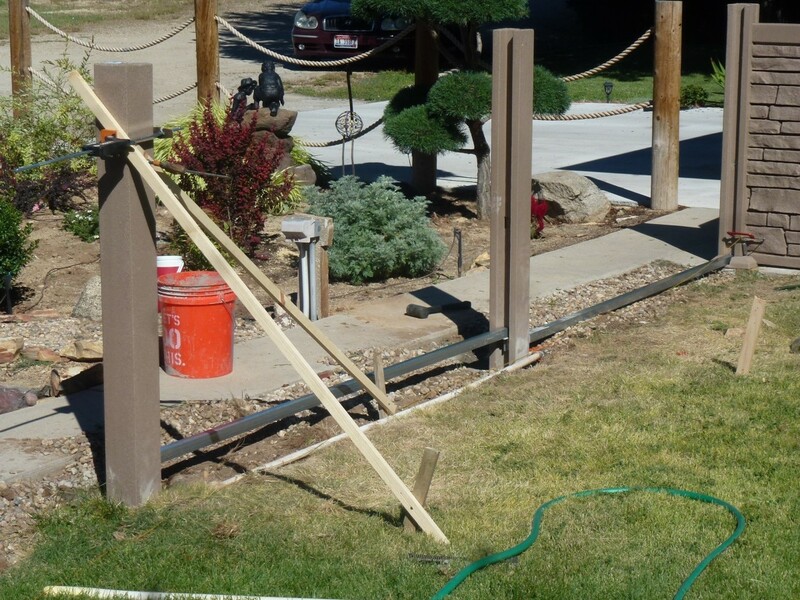 For our 4' gate, the posts were to be 50½" apart. Not 50¼", and not 51". Take extra care here and get those posts not only the right distance but absolutely vertical. It won't be the end of the world if other posts are out of plumb a quarter of an inch at the top, but it will if the gate post is crooked. Sim Tek has come up with a slick way to build a gate. It is reinforced inside with considerable steel, and is heavy as a result, but should last a long time without warping. Hinges have a bolt attached that is screwed into the gate as the first step. Fasten the latch pin to the other side of the gate, using the two large allen screws provided. Support the gate in place at the height you wish it to be, taking care that it will easily clear any ground variations as it swings open. Screw the hinges to the gate post, not the opposing end post, with two screws in each hinge. Open the gate and add two more screws to each hinge assembly. 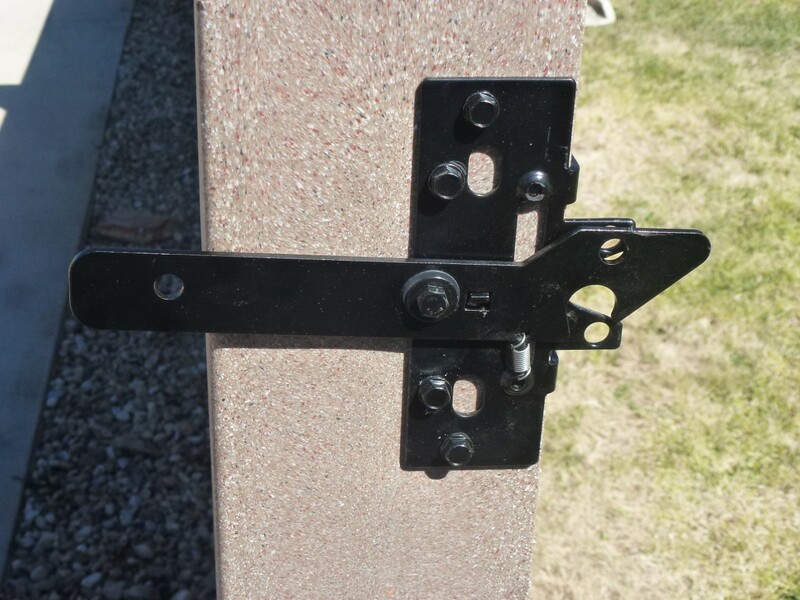 Finally, screw the latch assembly to the end post on the other side of the gate, using the latch pin as a guide to determine placement. 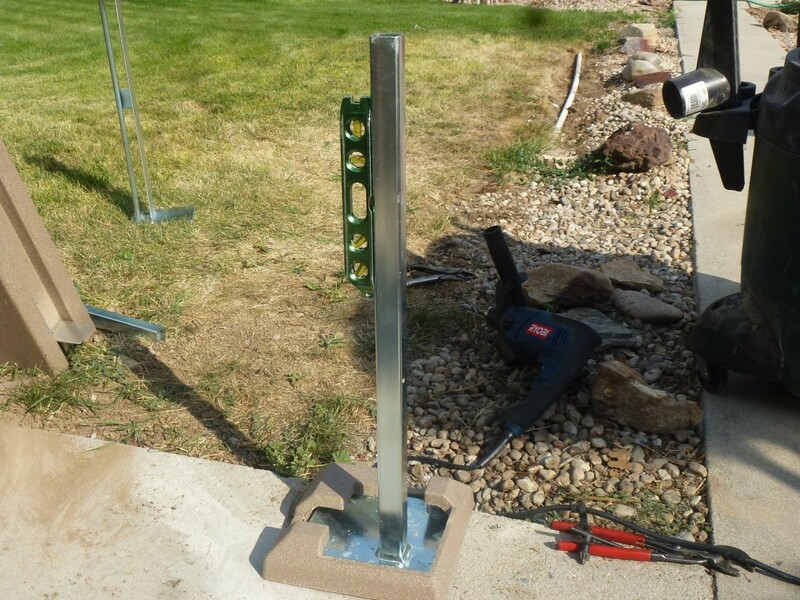 If the gate is not perfectly level, the bolts attaching the hinges to the gate may be screwed in or out as needed for a gate post out of plumb. 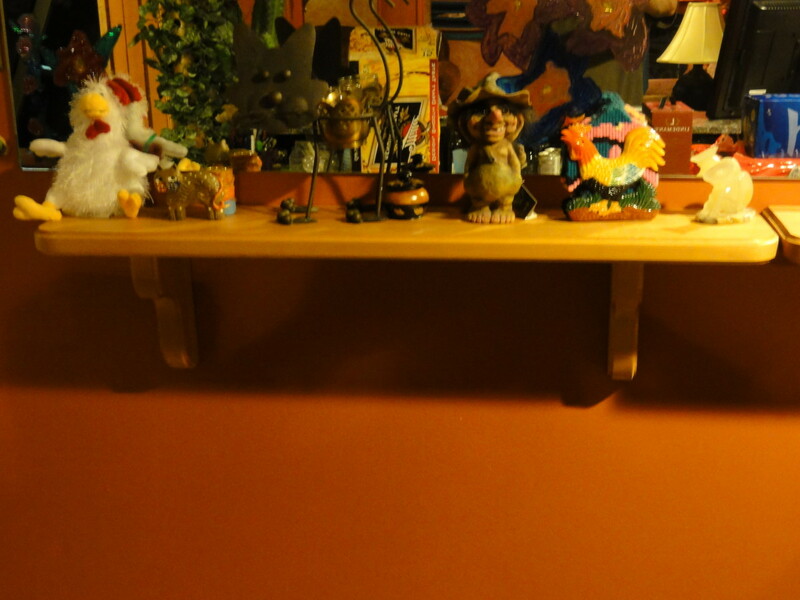 This will make the gate level, but will affect appearance if very much adjustment is done. The last thing to do is attach the post caps. These are simple friction fit caps, although screws could be added as a theft deterrent. They are driven on, preferably with a rubber mallet. If that is not available, a piece of 2X4 and an ordinary hammer can be used; you will like break your hand trying to drive them on by banging with the heel of your hand. They go on tight. 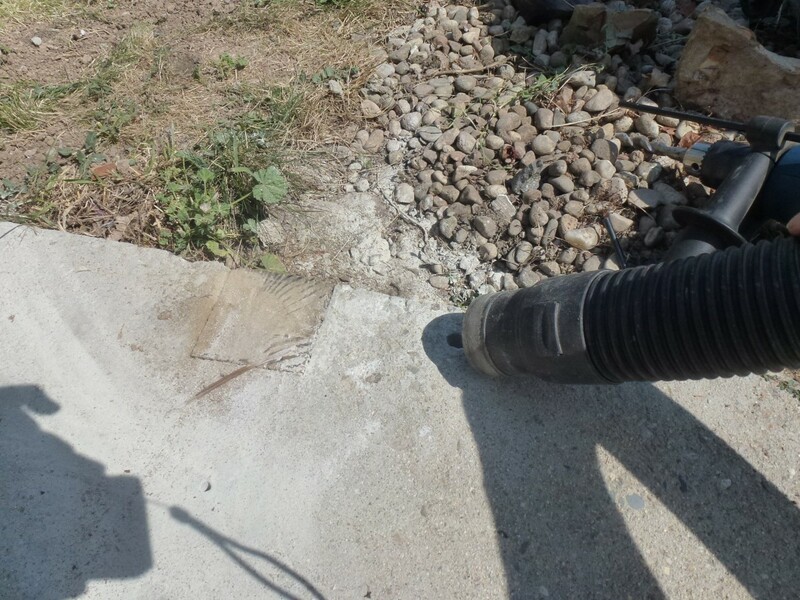 Clean up the mess, pick up the tools, and fill any depressions where dry concrete was added to post holes. You're finished! LOL the boards on my old fence mostly just fell apart when I took them off. Most had holes in them and were already split into at least two pieces. Even the posts were rotted out. Perhaps a third of it became firewood for camping and the rest went into the trash as useless even for that humble purpose. Hmm, very cool. I got offered 3K for my old weathered 50 year old fence boards. So I have been contemplating this. Maintenance is becoming too full time.